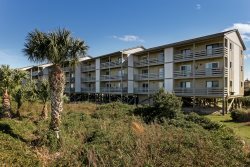 Located mid-island in the Premiere Beachside Colony Resort, this comfortable, family friendly condominium is located just steps from the beautiful Tybee beach. The master bedroom features a king size bed, cable television, an en suite bath with a whirlpool tub. Guest bedroom 1 features a queen bed and cable television. Guest bedroom 3 features a trundle bed. The den area features cable television and wifi. The spacious fully equipped kitchen with breakfast bar makes whipping up meals a breeze! You will never have to worry about keeping up with the laundry with the full size washer and dryer. Covered parking for two vehicles and elevator access round out the amenities of this lovely property. Please note large SUV's or trucks may not fit in designated parking area. About Beachside Colony Resort: Beachside Colony Resort is "the" Premier Oceanfront Resort on Tybee Island. This condo complex features 3 pools..one of these pools is heated!! Large heated pool 85 degree's 35'X12'...mid size pool 26'X8'...kiddie pool 12'X12'. Marlin Monroe's is a fabulous restaurant located on site as well just steps away from your rental property! !